Above: Fort Zachery Taylor beach. The Florida Keys are not known for their beaches. 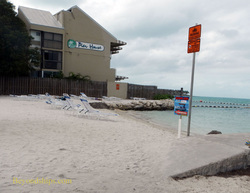 However, as a tropical island resort, Key West, of course, has beaches. The best beach on the island is often said to be the one at Fort Zachery Taylor State Park. It has public restrooms, a place to buy food, chair rentals, picnic tables and barbecue facilities. There are also nature trails and kayaks can be rented. The beach is a mixture of sand and rock. Smathers Beach, out towards the airport, is a two-mile long beach made from sand imported from the Bahamas. Vendors offer chairs, food and beverages. 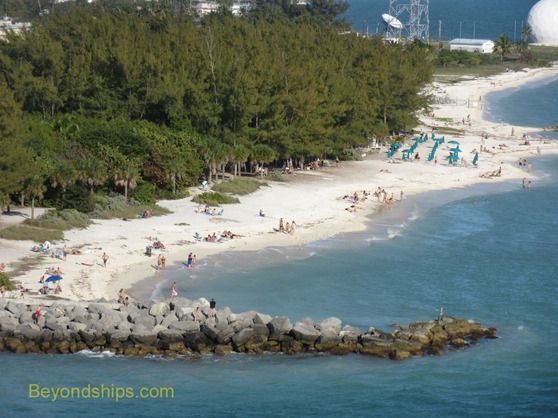 This beach is especially popular during Spring Break and Easter Weekend when hordes of young visitors descend upon Key West. South Beach at the Atlantic end of Duval Street (above) is a small but popular sandy beach. It has no public restrooms or facilities but is within walking distance of several restaurants. Other beaches include Higg's Beach, Dog Beach (canines allowed) and Rest Beach. Giving its name to the state park is Fort Zachery Taylor. Begun in 1845, the fort played an important role in the American Civil War. 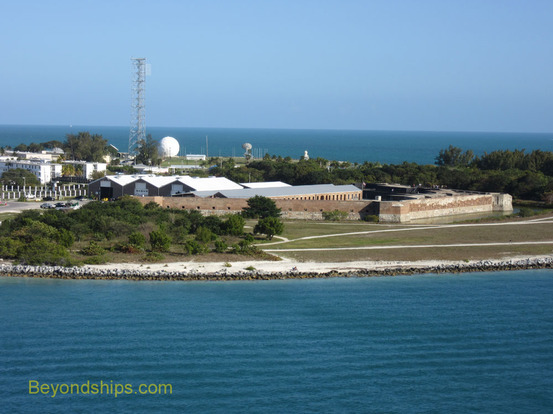 One of only three fortresses in Florida held by Union troops, Fort Zachery Taylor denied the Confederacy the strategic naval base at Key West. In addition, it menaced Confederate blockade runners. The fort is now a National Historic Landmark. Among other things, it holds the largest cache of Civil War era cannons. Across from the Navy Pier is the National Oceanic & Atmospheric Administration's Florida Keys Eco-Discovery Center. Here, visitors can explore exhibits about the ecology of the Florida Keys, including a mock-up of the underwater ocean laboratory Aquarius and a 2,500 gallon reef tank with living coral and tropical fish. Presidential Unit Citations for extraordinary heroism in action against an armed enemy. Visitors may tour this 327- foot Secretary class cutter.